Trough solar systems use parabolic curved, trough shaped reflectors focus the sun's energy onto a receiver pipe running at the focus of the reflector. 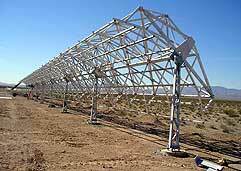 Because of their parabolic shape, troughs can focus the sun at 30-60 times its normal intensity on the receiver pipe. The concentrated energy heats a heat transfer fluid (HTF), usually oil, flowing through the pipe. This fluid is then used to generate steam which powers a turbine that drives an electric generator. The collectors are aligned on and east-west axis and the trough is rotated to follow the sun to maximize the suns energy input to the receiver tube. Click flow diagram above to see full size flow diagram of the new plants beig built in Spain. Current cost of electricity from these plants is $0.10 to $0.12 per kWh. The current goal of ongoing development by EERE is to reduce the cost to $0.035 to $0.043 per kWh by 2020. Trough collector solar power, also called solar electric generating systems (SEGS), represent the most mature concentrating solar power (CSP) technology, with 354 MW of installed capacity in nine plants, built between 1984 and 1991, all located in the Mohave desert of California. There are several generations of plants, the newer generations incorporating features that would reduce the cost of electricity if they were new plants. All plants are still operating and producing power for the electrical grid at 99% availability. The technology has been stagnant since 1993, but four new projects are now being developed. In the US, a 1 MW plant is being built by Arizona Public Service's at its Saguaro Power Plant and a 64 MW plant is being built in Eldorado Valley near Boulder City, NV. Solargenix is the prime contractor on both projects in conjunction with EERE/NREL. SHOTT North America is supplying the receivers. The Boulder City plant is currently scheduled to go on line in Jone 2007. Funding for the American projects has been difficult, but on 10/4/04 the Western Governors Association and EERE announced funding and support of a 1000 MW goal of concentrating solar power for the region by 2010. Included in this program is support for the two afore mentioned projects. Nevada Power and Sierra Pacific Power Company have signed long term contracts to buy the power produced by the 64 MW plant. Two identical 50 MW plants are being built by Solar Millinium AG in Granada, Spain. The first plant has received a €5 million (~$6.25 million) grant from the EU’s Fifth Framework Program and financial support from the German Ministry for Environment. To encourage this type of technology the Spanish government has set up regional funding programs. This is coupled with a bonus of 12 Eurocents per kWh generated from solar power has been instrumental in bringing such projects to Spain. A 150 MW facility that is to be expanded to 500 MW In the Negev desert of Israel is being developed by Solel (the successor company to Luz). Solel will establish a consortium to finance and build the power station, which it estimates will cost $1 billion. The state has promised to buy the electricity under the terms of a contract to be signed by the parties. 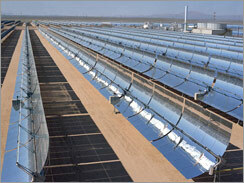 The first solar trough plants were constructed in California by Luz International. The first started up in 1984, the last in 1991. Altogether, nine such plants were built, SEGS I–VII at Kramer junction and VIII and IX at Harper Lake and Barstow respectively. In February 2005, all but two (I and II) of the Kramer Junction SEGS plants were acquired by FPL Energy and Carlyle/Riverstone. A natural gas system “hybridizes” the plants and contributes up to 25% of their output, a feature that allows operation later at night or on cloudy days to meet the requirements of the grid. FPL now runs these systems, making it the largest solar power generator in the United States. All of the power generated from the SEGS projects is sold to Southern California Edison under long-term contracts negotiated by Luz back in the 1980s. Improvements in the structural support system have received much attention as the collector assembly is the most expensive part of the system. SolarGenix, the contractor for the two new American plants has developed a new structural support system for the collector. The design uses an aluminum frame patterned after the Luz design, but superior in terms of structural properties, weight, manufacturing simplicity, corrosion resistance, manufactured cost and installation ease. One key point of in design of the structure is that it has to have extreme tolerances and structural rigidity in order to focus the mirrors precisely on the receiver pipe. High resistance to large wind loadings on the large structure is a very important parameter. Solargenix used computer modeling techniques that were unavailable at the time that the original Luz design was made. The collector assembly has been tested at the NREL test facility. A new improved generation of reciever tubes supplied by SHOTT will be used in these plants. FLAGSOL Gmbh, who supplied all the collector assemblies at the California plants is supplying the trough assembly for Solar Millenium, has gone through a similar development process to develop a new steel structure. The collector assembly has been tested at the Kramer Junction SEGS plants in California. Industrial Solar Technology Company (IST) has developed a concentrator system that incorporates the reflective surface as part of the collector structure. This results in a very lightweight, low-cost concentrator module that is also very strong. Solel's solar collector assembly includes an upgraded version of the Luz parabolic collector. It is designed for mass production and cost reduction by economies of scale. The reflectors are composed of individual concentrator modules that are a consist of a steel support structure with a mirror mounted on it. Development efforts are aimed at reducing the thickness of the mirror, improving the reliability of the glass to metal seal, surface coatings on the mirrors to improve their performance and development of a composite concentrator modules with lightweight, front-surface mirrors instead of heavy (4 mm) glass mirrors that were used on the original SEGS plants. Solel has supplied all the HCE's to date. In its newest model, the UVAC 2003, they have increased the annual average performance by more than 20% over the assemblies used in the Luz plants. Absorptivity, emissivity (radiative loss) and transmittivity (of the glass) all have been improved. IST's innovations include a receiver that incorporates a highly efficient blackened nickel selective surface and an anti-reflective coating on the glass envelope. The receiver pipe surface has a high absorptance for incoming light in the visible range, and a low emittance in the infrared wavelength. Shott Rohrgas has announced it is planning on producing HCE's and presumably will supply them for the Spanish plant. The seal between the glass and the pipe has not been as reliable as desired and development of better seal materials/seal configuration is underway. The HCE was connected to the stationary hot oil piping with a flexible tube in the Luz plants. Replacing the flexible tube with a ball joint will reduce the pressure drop in the hot oil piping piping by 50% and significantly reduce the parasitic power losses in the plant. The fluid going through the receiver pipe is routed through a thermal storage system which permits the plant to keep operating for several hours after sunset while the electrical demand is still relatively high. The thermal storage system (to be used in Spain) is a two tank system in which the HTF flows through the solar field and then through a heat exchanger where it gives up a portion of its heat to heat a nitrate salt solution that is stored in a hot salt tank. The slightly cooled HTF continues on to the power generation system. At night the hot salt solution flows through the same heat exchanger heating up the HTF for generating power. The cooler oil flows from the heat exchanger to the cold storage tank where it stays until daytime when it is reheated and returned to the hot storage tank. Sandia has tested a thermocline storage system that uses a single tank that is only marginally larger than one of the tanks in the two-tank system. A low-cost filler material, which is used to pack the single storage tank, acts as the primary thermal storage medium. Nexant has developed a near-term thermal storage option that uses biphenyl-diphenyl-oxide HTF in the solar field and then passes it through a heat ex-changer to heat molten salt in a thermal storage system. Kearney and Associates is investigating using a lower temperature molten salt as the HTF in the solar field as an innovative approach for reducing the cost of thermal storage for troughs. The Plataforma Solar de Almería (PSA), the European Test Center for Solar Energy Applications, in southeastern Spain is Europe's test facility for concentrating solar power development. They are developing direct steam generation technology to eliminate the thermal oil system that is currently used in solar trough plants, which would greatly simplifies the plants. The two-phase heat transfer that occurs in the receiver tube required evaluation as there are unique condition that occur in the tube. Results of testing to date indicate that the heat transfer was very sensitive to the small changes in temperature that occur in solar troughs and that their measurement accuracy was not good enough to correlate the data properly. PSA is also developing new trough collector assemblies and coatings to improve the absorption of solar energy on the receiver tubes and to decrease the reflectivity of glass. APS' 1 MW solar trough plant at the Saguaro power plant will heat mineral oil to between 250° and 500°F, lower temperature than used in other plants. Flowing through a heat exchanger, the heated oil will vaporize pentane, a hydrocarbon, which in turn will drive the turbine. The vapor then will condense back into liquid form and the cycle will repeat. This approach represents a departure from existing solar thermal plants, which use steam driven turbines. The capital cost for a steam turbine would be too great for such a small plant, instead, APS will use a 1-MW turbine similar to a geothermal plant’s. In 2004, German company Solar Millennium AG started work on two parabolic-trough solar power plants in Grenada, southern Spain. Two 50 MW solar trough power plants, AndaSol-1 and 2, are being built jointly by ACS Cobra and Solar Millennium in the region of Andalucia, with a 510,120 m² solar collector field and 6 hours of molten salt storage. Construction will start in autumn 2005 and will be completed in 2007. ACS Cobra and Solar Millennium have started development of various 50 MW follow-up plants in Southern Spain. The $1 billion Solel plant will be built in phases, in the first phase, a 150 MW plant will be build at a cost of approximately $250 million. The plants will incorporate a new trough Assembly incorporating their UVAC. No starting date for construction has been announced. Revised 11/12/05 to update data on Solergenix Bouder City plant. Thanks for another in-depth overview, Jim. One question, you write, "Two 50 MW solar trough power plants, AndaSol-1 and 2, are being built jointly by ACS Cobra and Solar Millennium in the region of Andalucia, with a 510,120 m² solar collector field and 6 hours of molten salt storage." By 6 hours of molten salt storage, do you mean the plant will encorporate 6 hours of storage capacity for peakshaving and backup on cloudy days? By 'molten salt' do you mean Vanadium Redox Flow Batteries? If so, this is exciting news as this technology has widespread applications in a variety of variable renewable energy sources (wind, solar, tidal etc). And 6 hours of backup for a 25 mw plant is a large amount of backup and could go a long way towards solving the unreliability problem that many variable output renewables face. Hi, I'm looking for mor information about the plant in Saguaro. Could you help me giving me any link. And... you have an error. It is Granada instead of Grenada (typing error I know). I m student , Ive got assiment to research about solar chimney power station.can u please send me infomation about the following topics concerning to the solar power station. viability, availabity ,sustainability of the technology,financial implication,impact on the rnviroment,scope for application in the south africa context and list of sources. good day!! i would like to inquire about the types of materials that can be used in solar trough? also, their features, advantages and disadvantages. And what are the reflectivities of parabolic trough? i would really appreciate your response on this. In your fourth paragraph above, there a few minor errors. SEGS I and II are located in Barstow. SEGS III though VII are at Kramer Junction and SEGS VIII and IX are at Harper Lake. SEGS IX was completed in December 1990. Hi to fellow former Luz'ers! I am working on solar ice maker using CaCl2 absorber and NH3 as a refrigerent. I am confused how to fill up CaCl2 in the receiver of the Parabolic trough collector. Is there any more constituent than CaCl2 in the receiver? I heard that parabolic troughs can operate with water/water steam as working fluid (DISS/INDITEP projects). Do you know if the receivers used for synthetic oil applications are the same ones as those used with water/water steam in a high range of pressure (100bars) ? Do you know any companies which manufacture such a receiver ? Can you give me an idea of the price/m2 of such a parabolic trough (with the receiver)? Thanks in advance. Hi, I'm looking for more information about glass to metal seals technology or patent.Could you help me giving me any link. i would like to know whats the composition of the trough(reflector).. thank you sir.. Since the Parabolic trough is so successful at generating the heat needed to create steam through a heat transfer medium such as water/steam or oil, is anyone creating energy with a true parabolic dish operating on a gimbal or similar transiting device to follow the focus on the sun's rays? It seems that if the sun's energy can be multiplied 30-60x by the simple trough, it should be able to be multiplied at a much greater number using a true parabolic dish.. What would be the optimum curve for a parabolic dish to be productive at it's optimum. Are their lines/pipes available for the transmission of steam/water or oil that can be flexible for the facilitating of moving the medium during the dishes transit in following the sun without losing the medium. I have an interest in using such a configuration near the Salton Sea. Im building a parabolic through in small version. I would like to have information on how can I have the best result of a glass turned into parabolic shape? I mean the mol is prepared from iron profiles shaped as the parabola but the inner side (from the center, north to south) of the mold has only one profile as a supporter of the glass while it will bent in the oven. Now, The problem is to let the glass bent perfect, what type of layer design should I use in order to have the optimum bending with out misformation? Make a profile then draw it along long ways to mold first sand then clay over it into the correct support shape. Then bake it. Then scrape and sand it down into the perfect form to bend the glass over? Cover it with a piece of tin, real tin will not stick to the glass. Just a thought. parabolic trough thermal power plants have succeeded since 1990s,but the LEC of solar power is still much higher than the conventional fuels. Thanks to GEF's funds for the abundant solar resource countries to develop the ISCCS,this system that integrated fossil fuels will have advantage of price , the net solar to electricity efficiency will be 20%,which is higher than the efiiciency of "only solar" system. I am a university student and I am studying the since and engineering of materials. I would like to know what the composition of the receiver pipe is. I apreciate your help on this subject. Thank you sir. Do you have any information about the newest sun tracking systems and collector moving systems. "is anyone creating energy with a true parabolic dish operating on a gimbal or similar transiting device to follow the focus on the sun's rays?" We have a customer for up to 50Mwe of concentrating solar power, using molten salt technology for 24/7 baseload power generation into the grid. We favor solar power towers, but will consider troughs. We would like to hear from anyone with personal experience with Solar II, or the Mojave Parabolic Trough projects, who is competent to design and supervise construction of a plant. We offer a generous relocation package including housing and car. We will countenance offers from component manufacturers interested in building their components here in Namibia. With our semi-skilled workers earning $100/ month, we feel that domestic production offers the advantage of greatly reduced cost. We know that given the right cost level, Namibia will buy 600Mwe of concentrating solar power in the immediate future. Public Research Institute(Namibia) Pty, Ltd. I'm a student who is seeking as much information as I can about Parabolic Trough Power Plants. Your site offers alot, but I already have most of that information! I am doing a project on the feasibility of creating a Solar Parabolic Trough Power Station in a certain location.... Any help would be greatly appreciated! Thanx for your time!! I want to know that how much space will be neded to produce 1MW electricity using this type of power plant. sun is the natures` gift to man with abundant heat energy and we are utilising very small portion only.> If we start to utilise the maximmum possible ways then there will not be any problem on GLOBAL WARMING.Really every nation should formulate a high level policy to encourage the people to see the possible ways in their life to have a solar equipments and every should contrbute their part to convert this energy which can be tapped without fuel. In india there is no encouragement and want to become a solar engineer. (iam a mechanical engineer very much intrsted in non conventional energy). Please find information on parabolic dish and trough used in solar energy collection techniques and the holy grail the Stirling motor. Its about 0.2mm thick aluminium sheet highly reflective. I understand there are only 4 collectors manufacturers (Solargenix, Flagsol, Solel, IST), is that right? Has there been evolution since the article was posted? Are they all using glass reflectors? Who is manufacturing and providing the reflectors? I'm guessing other reflector materials such as aluminum could be lighter and cheaper. Why are they not used? Have there been recent evolution or are there expected changes on this reflector aspect? I've just been trawling the web looking for software that allows a PC or Mac to control a heliostat. Seems to me a lot of hours will be wasted by every two bit solar developer just to work out where the sun is at any given moment. The position of the sun must be a function of time, latitude and longitude, but it's an extremely complex function due to slight axis wobbles etc. Lightbulb idea: run a web service that accepts these params and returns the direction to the sun in a variety of formats to suit all common solar tracking device types. This is the internet era. We no longer need to invent the wheel more than once. Sun trackers would then only need to worrry about calibration, they would have accurate sun direction data, 24/7. Google.org? This one's right up your street. does anyone have direct experience using a refrigerant in a concentrated solar trough collecter to drive a turbine? I'm more interested in small-scale projects. We are seeking designers of Solar Ice Makers using ammonia absorption technology. Interested party please contact us. I m student , Ive got assiment to research about solar power station.can u please send me infomation about the following topics concerning to the solar power station. latest technology,applications,companies that use solar power in south africa,financial implication,impact on the rnviroment,scope for application in the south africa context and list of sources. I'm an engineering student and am coming up with a plan to set up a power plant based on renewable energy for my university campus. I need cost estimates for a parabolic trough based power plant and a solar dish engine based power plant each with a 3.5 MW capacity and a peak of 5 MW. Can someone please help me in this regard? Rohan, you might want to consider Ausra's compact linear fresnel reflector design instead of troughs. It's much simpler and probably more cost-effective. There have been a few posts on Ausra's design on this blog recently. Rohan, more info is needed concerning the energy pattern of the university and location. A 5 MWe steam plant ball park cost is $4-5M. Add $10-20M for solar collectors. For the Ausra's design, the collector capital costs are actually a lot lower. About 2M for a large field, not more than 3M for the small one that Rohan is looking at. Hi, Thanks for the prompt replies. I read up a bit on the Ausra design, and it seems a good option. Can you suggest a comprehensive resource on the net so I can look at it in more detail? Also, the idea is to distribute the technologies (for lack of a large empty space in the campus) over various places such as small clearings and rooftops etc. The inherent modularity of the Solar dish-engine is a definite advantage in such a scenario. How is the PV option? I've read that walmart and google have set up PVs for supplying their needs, which are similar to ours I guess. We will also explore others such as biomass, wind and then finally come up with a plan which might turn out to be a hybrid of all these. Btw, the location is in a fairly high insolation area, 18.55N latitude (Mumbai), getting between 6-8 kWh/sqm/day throughout the year. Amster says $3 million for a 5 MW peak capacity Ausra plant? says Array installed cost US $3.25/Watt at SM3. So that would be $16.25 million for a 5 MW Ausra plant at SM3. While I could believe that an SM1 plant might be half that and be around $8M, I can't believe that it would be just $3M. Reading that table again, I'm puzzled if that $3.25/W is just the collectors, and how much do they believe the steam turbine plant and the storage to cost. Seems a bit obfuscated. Clee, it looks like you are reading the table correctly. I do not think that the BOP and storage cost are included. Rohan, I do not know enough about the biomass or climate of Mumbai to provide much help. Generally speaking adding a biomass or fossil fuel would improve the economics of a solar thermal plant. Yes what I would like to say is that I am confused as to why Ausra is so much cheaper than existing plants. There is no difference once the steam is produced, so to make steam don't both types of trough plants need mirrors and pipes to heat the water to steam. Also if Ausra is so much cheaper why are people still building the old style trough plants? I have read that there are many many trough plants being built in Spain, Israel, and Africa. Are these Ausra plants or the old style? I have looked for more info on Ausra's operating plants but I cannot seem to find anything. Where is their largest plant that is producing electricity today? Thank you for maintaining such an excellent resource. What size heat exchangers (let's say aluminum) are typically used in parabolic troughs to maximimize efficiency yet avoid failure and minimize cost? I M FROM PAKISTAN AND HAVE SPINNING MILLS. I AM INTRESTED IN SOLAR TROUGH PANNEL. MY REQUIREMENT IS 2000 K.V.A SOLAR PANNEL IN PAKISTAN. COULD YOU PLZ HELP ME TO INSTAL THAT CAPACITY ENERGY PLANT FOR INDUSTRIAL UNIT. I think this website is great, but it doesn't offer the ability to print out basic info on the description of these energy solutions/technologies. I would have printed out the basic description of parabolic trough solar and included it in a letter to my congressman if a printout was available. Doing a printout for each type of technology would be helpful for educational purposes.